Global fish producer Marine Harvest has applied for an aquaculture licence for a twelve to fourteen cage salmon farm at Shot Head, Adrigole, Bantry Bay. 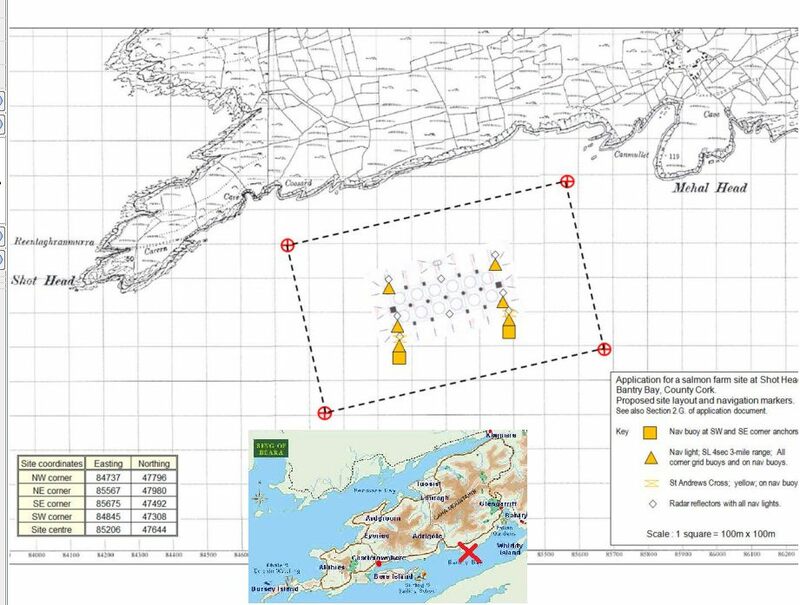 The Location of the proposed Salmon Farm is Shot Head, Trafrask, Adrigole, Bantry Bay and it will cover an area of 42.4 ha equivalent to 106 acres. A public notice was published in the Southern Star on 14th January 2012 informing the public that an Environmental Impact statement had been published and was available to the public who were invited to make submissions or observations within four weeks from the date of publication of the notice. The Southern Star also published an article which was in reality a marketing speech for the proposed development. In Febuary 2012 a meeting was held in Adrigole to gather views on the proposed salmon farm at Shot Head. A crowd of over 100 gathered, nearly all of whom were strongly opposed to the development. Concerns ranged from impact on water quality, wildlife, angling, fishing, tourism, shipping navigation, and watersports. Realising we needed to join forces, Save Bantry Bay was formed. Since then a supporters meeting was held in Glengarriff, which over 200 attended. A media campaign established, resulting in local and national press coverage. A political lobbying programme developed, with all local TDs being met, as well as key Ministers. Website and leaflets produced, and demonstrations organised. And, we will continue this work until we achieve our aim. Cork’s coastal and inland waters are a major asset in terms of tourism. It is estimated that the marine leisure sector supports 14, 500 jobs, [compared to the 250 employed by Marine Harvest nationally] There is considerable potential to increase this, which could be important throughout the County (East and West Cork in particular). The West Cork Strategic Plan and the Cork Area Strategic Plan emphasise the potential for development of marine leisure. In addition a significant level of income can be generated from wild salmon fisheries. The five main rivers that enter Bantry Bay are all salmon rivers. The contribution to the economy of one wild salmon caught by an angling tourist is estimated to be €423. Farmed fish spread diseases and parasites to wild salmon. Some cultivated escapees also interbreed with the native fish, reducing the ability of their offspring to survive. Research finds that the mortality of wild salmon from farming is really large in many cases — more than 50 percent reductions every year, that is not sustainable for any populations. The farm also pollutes the local environment with sediments from waste feed and faecal matter, nutrients and toxic chemicals used to treat the salmon for sea lice infestations and disease. Drift nets are now banned and there is a real opportunity to develop wild salmon fishing which can generate numerous jobs and income to the local communities. Commitments under the Bantry Bay Charter state that wherever possible, decisions affecting the Bantry Bay coastal zone should be taken on the basis of consensus; where general agreement amongst the local community is reached. This is so that the decisions can have the strongest support from within the community. Such un-referenced blanket statements do nothing for the credibility of your organisation. Thank you for your comment. As you point out, ensuring all information provided is evidence based is vital for any organisation. A copy of the abstract for the peer reviewed paper, a meta-analysis incorporating data from three countries, including Ireland, is below. You may find a full copy of the paper on the internet http://www.plosbiology.org/article/info:doi%2F10.1371%2Fjournal.pbio.0060033, or a local university library should help you source one. In the interests of making our information accessible to the widest audience possible, we have chosen not to include references / footnotes on our website. This is standard practice for many environmental organisations. However, all our information is evidence based and all claims may be substantiated. We are happy to provide further details whenever asked. Since the late 1980s, wild salmon catch and abundance have declined dramatically in the North Atlantic and in much of the northeastern Pacific south of Alaska. In these areas, there has been a concomitant increase in the production of farmed salmon. Previous studies have shown negative impacts on wild salmonids, but these results have been difficult to translate into predictions of change in wild population survival and abundance. We compared marine survival of salmonids in areas with salmon farming to adjacent areas without farms in Scotland, Ireland, Atlantic Canada, and Pacific Canada to estimate changes in marine survival concurrent with the growth of salmon aquaculture. Through a meta-analysis of existing data, we show a reduction in survival or abundance of Atlantic salmon; sea trout; and pink, chum, and coho salmon in association with increased production of farmed salmon. In many cases, these reductions in survival or abundance are greater than 50%. Meta-analytic estimates of the mean effect are significant and negative, suggesting that salmon farming has reduced survival of wild salmon and trout in many populations and countries. regarding opinion on the use of such modelling. This comment is not directly related to the Ford/ Myers paper but a similar study ( of which there are many) . Most of which are posted at http://www.salmonfarmscience.com including comments and rebuttals. If your intention is to spread misinformation, cast doubt, and obfuscate the facts then nevermind this letter. Thank you for your response. It is always interesting to hear the pro-salmon farming perspective. As you state there are many research papers regarding the impact of farm based sea lice on wild salmon populations. This is why we quoted a research paper that combined the data from multiple research studies (these are known as meta-analysis). On this particular point the maths is quite simple. Combining data from lots of studies will lessen the impact of any one particular study. And, the result shows a 50% reduction in wild salmon populations in areas where there are salmon farms. The link you provide offers a critique of a study by Krkosek et al, and questions their data selection. To say a critique of this paper alone puts in question all research is far too simplistic. For a start, different research teams will use different methodologies, data selection, mathematical modeling, statistical analysis and so on. Studies may also be conducted in very different environments, with widely varying external factors such as locations and numbers of salmon farms, distances from wild salmon rivers etc… Again, this is why we feel it is best to look at meta-analysis (that take the quantitative data from many studies) and review papers (that take the qualitative data from multiple studies) rather than papers that use a single data cohort. There was a day when research was published questioning the impact of smoking. Over time many studies were completed on this issue. By examining data from all studies, we are now in no doubt. Finally Save Bantry Bay advocate until the evidence is in no doubt, the precautionary principle should prevail. Until this point in time, we will campaign for no more salmon farming in Bantry Bay. Dear chloe, the link i provided was an example of criricism of the type of study that uses complicated mathematical modelling. to deduce alarmist statements such as ‘50% reduction in wild salmon populations in areas where there are salmon farms’ Certainly you are aware that studies such as these (including the one mentioned in your article) are correlative as there is currently no proof of causation. For example currently there is no mechanism to establish a causal relationship amongst farmed salmon, wild salmon and sea lice.and subsequently impossible to any quantify detrimental effect on wild salmon. Clearly more science is necessary.. On the other hand there are dozens and dozens of correlative studies claiming every doomsday scenario imagineable. (BC) by 2010. Well as you have read in the link; the Pink Salmon are actually returning in numbers with a record run in 2009. You may also notice that Ford and Myers are participants in both studies .and numerous others studies predicting similar calamities that simply don’t happen. I’ve read them all, have you? You state that ‘studies such as these… are correlative as there is currently no proof of causation’. It is true that a correlation does not automatically imply that one causes the other. However, it does indicate a possible cause worthy of further investigation. Here is an analogy that may help. If your child attended an open day at a school that had an outbreak of head lice, and a few days later you discovered your child had head lice would you assume he/she caught them when at the school where the outbreak was present? Or, because you could not track the journey of the individual egg bearing louse that infected your child would you state it is impossible for them to have been contracted from the school with the infestation? As you say there are many studies. The results of these have led to today’s consensus that sea lice from salmon farms have an impact on wild salmon. Indeed, the International Council for the Exploration of the Sea and the North Atlantic Salmon Conservation Organisation International Symposium, noted ‘Sea lice infestation pressure from salmon farms is an important issue affecting wild salmonids in many areas’. Even industry representatives at his meeting acknowledged that ‘it can no longer be claimed that salmon farming does not pose a threat to wild salmon’. L.P.Hansen & M.L.Windsor, (2006) ICES Journal of Marine Science, 63:1159-1161. We do appear to be in agreement insofar as “more science is necessary”. Until then, we’d prefer not to risk our bay, our rivers, our wildlife, or our environment.